This is the Welcome Break service area on the M40 at J8a. For Welcome Break's services at the A34/A40 junction in Oxford, see Peartree. For Moto's site at J10 see Cherwell Valley. 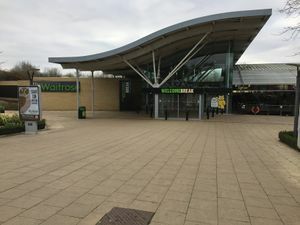 Modern services on the M40, Oxford is notable for its landscaping and fountains around the front. It has a good amount of open space at the back, but this is slowly filling with new and trial facilities. First two hours free for all vehicles, after which cars must pay £15 for a further 24 hours and HGVs, caravans and coaches must pay £30 (or £32 to include a £10 meal voucher). There is a kennels and farm accessed from within the services. The cul-de-sac they are on leads to an original, isolated section of the A40. In July 2015, Oxford was one of three sites to gain a Tesla Supercharger, the first three on the motorway network. The original (1994) design for the building was of a courtyard design, like Sarn Park crossed with Lymm. A few miles west of here the A40 has two large lay-bys with toilets, which were built to serve traffic leaving the motorway prior to the services being built. The southern-facing sliproads at J8a were added specially for the services, and it was first planned for the northbound offslip to lead straight into the service area. When the services were proposed other plans were considered at Tetsworth, Stokenchurch and Lewknor. Another site was considered on the other side of J8a, where there is currently a golf course, put forward by Wyatt Bros.
Before the services were built, one of the final changes saw the removal of a second storey from the new planned building. But unlike its sister site at Hopwood Park, the second storey would have housed only offices. The site of the services crosses an abandoned railway line. The early plans listed the services as 'Wheatley', but this was changed to Oxford upon opening. Like many services, this decision has attracted criticism as it's not that close to Oxford, and Welcome Break's other site at Peartree is actually closer to Oxford than their 'Oxford' site. Prior to it opening the site was known as Lower Farm, and briefly as Wheatley Triangle. The services opened on 19 July 1998 by Anthea Turner and were expected to be the last services to open on the M40, a road which originally held the record for the longest major road that doesn't have any services. Within a week of the services opening, the fire brigade were called twice: firstly there was a minor petrol leak and a few days later a fire was started deliberately in the toilets. 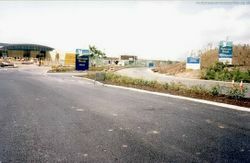 The latter incident happened just two days after Welcome Break lost their nearby South Mimms services in a large fire. Oxford has been used to trial many major brands over time, including Waitrose, a Krispy Kreme store in December 2012 and Dunkin' Donuts in July 2014. The hotel underwent a major refurbishment and reopened on 1 October 2014 as Ramada, replacing Days Inn. A PizzaExpress restaurant opened here in October 2017, the first of several planned openings. It was built in a new building next to the hotel, which is in a similar style to the building which was built to house Ed's Easy Diner at South Mimms, which is also now a PizzaExpress. Upper Crust and The Pasty Shop opened within a refurbished WHSmith in the filling station in April 2018.